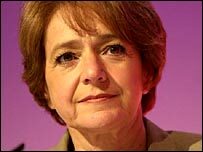 Barking MP Margaret Hodge has been asked to resign over comments which, critics say, inadvertently boosted the BNP local election vote. Mrs Hodge said 80% of white families in her east London constituency were tempted by the British National Party. The far-right party won 11 of the 13 seats it contested in Barking and Dagenham, making it the second party. The London GMB union wrote to Mrs Hodge on Wednesday, asking her to step down over her "misguided" comments. General Secretary Ed Blissett told BBC London: "We have taken this unprecedented decision because of Margaret Hodge giving so much publicity to the BNP which allowed them to win a large number of seats in Barking and Dagenham. "I don't think they would have won [the seats] without her misguided and misjudged statements. It is now time for Margaret Hodge to stand down as MP for Barking." Mrs Hodge, a Labour minister, has denied the GMB's claims. Before the election she said the east London area's change from a white area to a multi-racial community had caused some people to seek out "scapegoats". Voters felt Labour were not listening to their concerns on immigration, she said, and were "tempted" by the BNP. Speaking after the local election results she said: "What I was talking about was what I was hearing on the doorstep. "You have to remember that last year, at the general election, the BNP secured 17% of the vote here, so I think I was reflecting something that was happening. "The important thing now is to move forward and decide how we are going to deal with the issue."